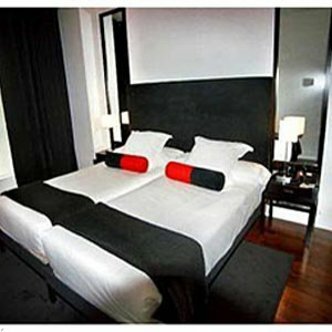 The Quo Puerta del Sol Hotel is ideally located just off Puerta del Sol in the heart of Madrid. The exclusive shopping, commercial and amusement address of Gran Via Street and Alcala Street are all within easy reach. Also the historical Madrid de los Austrias and the most important museums are in the surroundings. Brand new design hotel built in a historic building. 51 standard double rooms,10 Superior and one Junior suite all of them fully equipped with ADSL, Free high speed internet access,minibar, TFT TV sat, phone, safe box in room and welcome amenities. Superior rooms have unique views of the city from the private terrace and are equipped with slippers, bathrobe and trouser press. Our qualified staff are more than happy giving you an exceptional service.